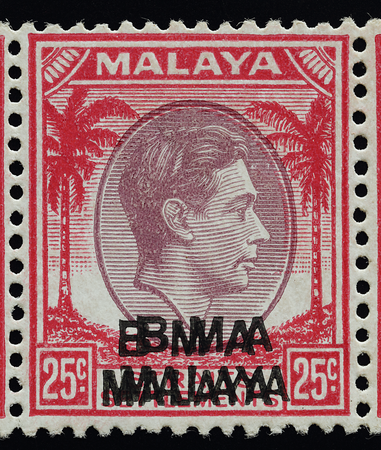 Among the shenanigans of BMA stamps, the 25 cents with double overprint (Kearney 1983) ranks high in rarity, celebrity and mystery. 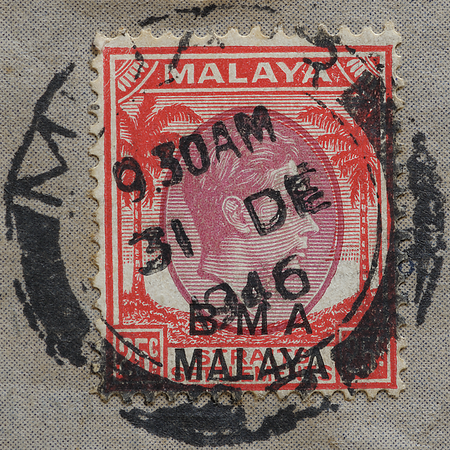 The sheet carrying the defective overprints was despatched to the Ipoh post office where local philatelist Chong Mun Siew bought it at face value (Associated Press, 21 August 1946). The alarm was raised soon after; so spectacular the errors were that the postal authorities reportedly confronted Chong on repeated visits, but he did not surrender (Norris 1983). Chong told AP that no other instance of the error had been found over a three-month investigation by the authorities. This could mean he had bought the sheet around May 1946. The AP report said local and London bidders offered Chong £10 a stamp or £1000 for the sheet, but he declined. At some point before or in 1957, however, the sheet was broken up and sold by H.R. Harmer in London. This ex-Cooper strip was submitted by a Fred Kahn to The Philatelic Foundation in New York, where it was certified in 1957. It is from the second row from the top of the sheet. 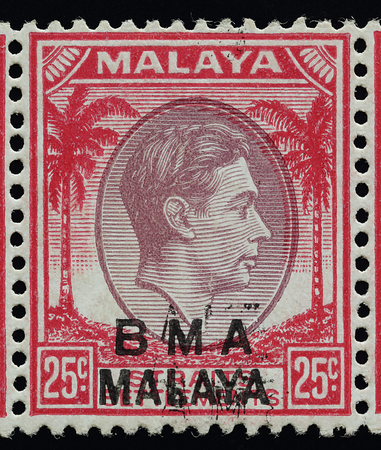 The stamps are believed by the author to be of the 1945 first printing of the denomination (Cameron 1950). 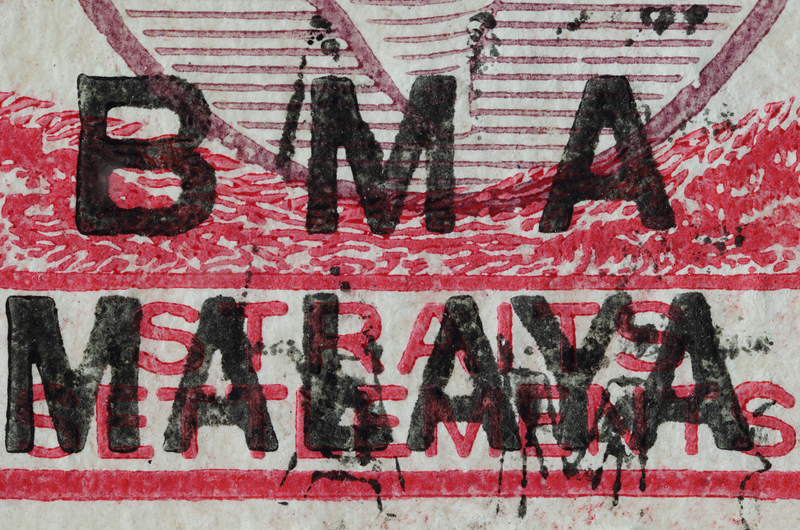 As the sheet was rotated slightly relative to the plate in the time between the two applications of the overprint, the relative positions of the double overprints on a given stamp vary depending on the part of the sheet the stamp was in. According to prevailing theory (Norris 1983), a previous sheet or backing paper received the overprint, got stuck on the plate and escaped notice. The left and right sides of this stray sheet curled downwards as the plate was lifted for overprinting the next sheet, and when the plate came down, the folded stray sheet created reversed offsets in the middle portion of the latter sheet. 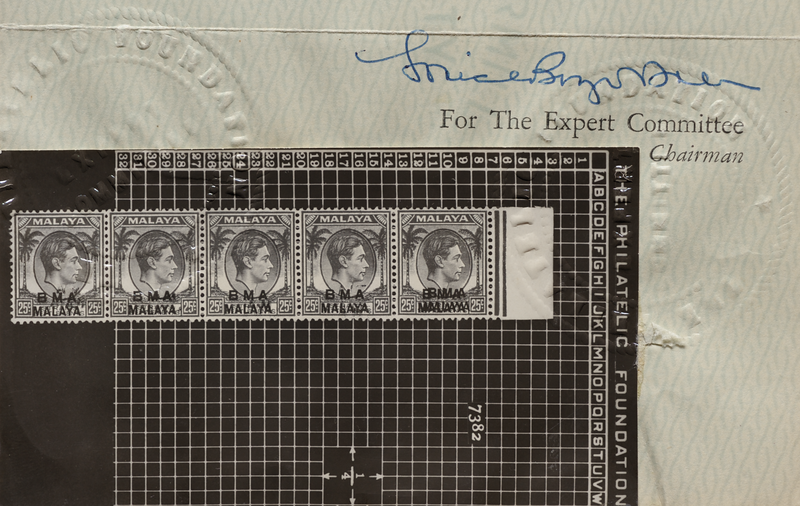 The stray sheet was then noticed and removed, and the latter sheet was given a second run, making double overprints on the stamps in the right and left portions of the sheet. Letterpressed beauty: the rotated and reversed offset on the first stamp in the strip, showing mostly the thickened letterpressed edges which took longer to dry on the stray sheet and got transferred to the next sheet. "Stamp no. 9", the second last in the strip, is most spectacular with its quintuple overprints. There are three reversed offsets, of which two apparently originated from the left side of the stray sheet and one—very nearly horizontal—from the right. There is also an albino or 'ghost' overprint, created when the plate embossed the stamp through the intervening stray paper without depositing any ink; it is more readily discerned on the reverse where both it and the inked overprint have picked up dirt from the bottom of the press. Albino overprints are also known on the 1 cent black. The longitudinal overlap of the two rotated offsets with the almost horizontal one on Stamp no. 9, however, poses a problem for existing theory, because the two different groups of offsets could not have been made simultaneously. Furthermore, the nearly horizontal offset looks as if it was made with more force and when the ink was dryer. The author postulates that only the right side of the stray sheet came loose when the plate first came down with some force on the subsequent sheet, producing the nearly horizontal offset. Then, as the plate was lifted, the stray sheet finally detached fully starting from the left, glided towards the right according to aerodynamic principles and fell—by the gentle pull of gravity—onto the subsequent sheet as far as the 9th stamp. 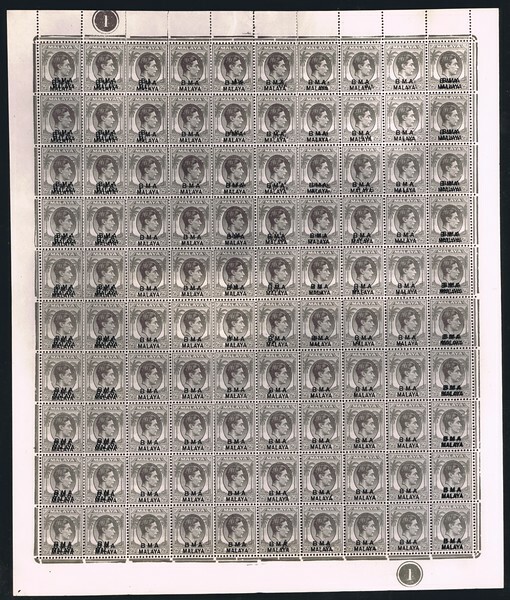 The theory so far, however, rests on the basic tenet that the complete impression of 100 overprints was made after the incomplete one that had been partly obstructed by the stray sheet. It also implicitly assumes that the plate was not being re-inked before each application—otherwise the stray sheet would have been noticed before processing the next sheet—a tenet challenged by the rich inking and letterpressed edging of both iterations of the double overprint. 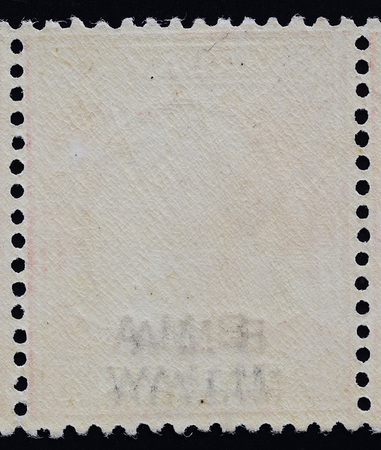 The way the translucent double overprints overlap seems to indicate that the reverse happened—that the complete impression was made first (Lin 2017b). Furthermore, the two overprints seemed to have been applied in relatively quick succession, given that the plate pressure of the later impression was able to obliterate the letterpressed edges of the earlier one before they dried. 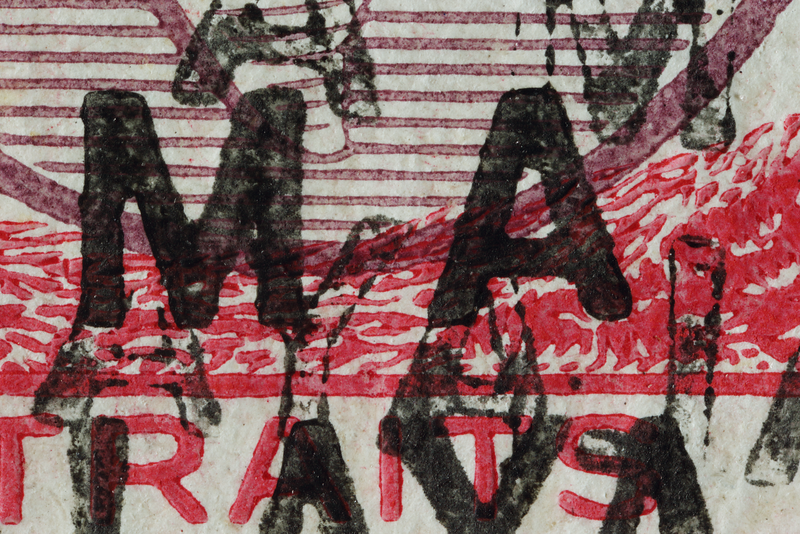 The evidence of the full impression having been made before the partial impression is corroborated by the other stamps in the strip, whose single overprints exhibit a thinner and fluffier texture with eroded edges where they were "squashed" by the albino overprints. 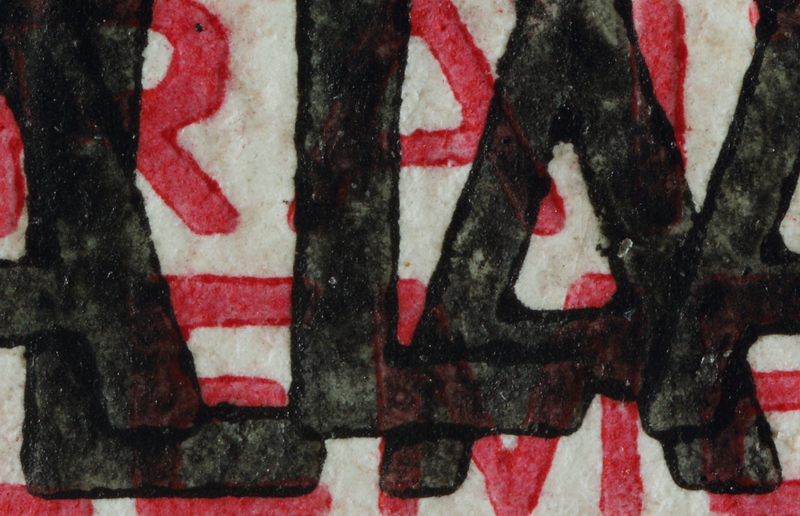 This suggests that the albino was made after the inked overprint, and is particularly obvious in the letter "B" (above), where the areas of undisturbed and disturbed ink are separated straight down the middle. The mystery continues. A normal 25 cents on an aerogramme.